One of the major strengths of Tiled is that it allows setting custom properties on all of its basic data structures. This way it is possible to include many forms of custom information, which can later be used by your game or by the framework you’re using to integrate Tiled maps. Custom properties are displayed in the Properties view. This view is context-sensitive, usually displaying the properties of the last selected object. For tiles in a tileset or objects on an object layer, it also supports multi-selection. The property type is used to choose a custom editor in the Properties view. Choosing a number or boolean type also avoids that the value will get quoted in JSON and Lua exports. When custom properties are added to a tile, these properties will also be visible when an object instance of that tile is selected. This enables easy per-object overriding of certain default properties associated with a tile. This becomes especially useful when combined with Typed Tiles. Inherited properties will be displayed in gray (disabled text color), whereas overridden properties will be displayed in black (usual text color). Usually you only use a limited set of object types in your game, and each type of object has a fixed set of possible properties, with specific types and default values. To save you time, Tiled allows predefining these properties based on the “Type” field for objects. You can set this up using the Object Types Editor, available from the View menu. By default, Tiled stores these object types in the user settings. However, since you’ll often want to share them with other people in your project, you can export your object types or change the storage location of the object types file. A simple XML or JSON file with self-explanatory contents is used to store your object types. The color not only affects the rendering of the various shapes of objects, but is also the color of the label which will show up if you give your object a name. To make the predefined properties show up in the Properties view, all you need to do is to enter the name of the type in the built-in “Type” property. Usually this is what you’re doing already anyway to tell your engine what kind of object it is dealing with. If you’re using tile objects, you can set the type on the tile to avoid having to set it on each object instance. 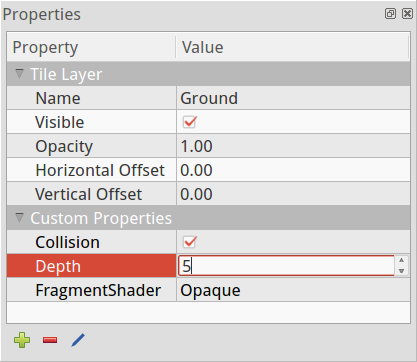 Setting the type on the tile makes the predefined properties visible when having the tile selected, allowing to override the values. It also makes those possibly overridden values visible when having a tile object instance selected, again allowing you to override them. An example use-case for this would be to define custom types like “NPC”, “Enemy” or “Item” with properties like “name”, “health” or “weight”. You can then specify values for these on the tiles representing these entities. And when placing those tiles as objects, you can override those values if you need to. Enumerations, where you can predefine all possible values and it forms a combo box (#1211). Object references, which would allow easily linking objects together and Tiled could display such connections (#707). Array properties, which would be properties having a list of values (#1493). Dictionary properties, which would be properties that can contain any number of other properties as children (#489). It would also be nice to add support for limiting property values, like the length of string properties or a minimum/maximum on number values. Finally, the predefined properties would work very well together with explicit support for projects. Then you could switch between different projects or get started on an existing project, without needing to configure Tiled to use the right object type definitions.